What would the world be like today had the greatest civilization never fallen? By the time Spanish explorers reached the Americas, the Aztec Empire was one of the greatest powers in the world. The ancient priests would slaughter human sacrifices, sometimes by the thousands, all under the pretext that their gods needed blood to make the sun rise every day. What would have happened had this empire prevailed over the Spanish and survived to this day? How would its bloodthirsty theocracy fit in with our world? Myla is an upper-class teenager in modern-day Azteca, partying her days away with her friends and the man who has claimed her as his wife. On her seventeenth birthday, she is finally “enlightened” and told the truth: that the Priesthood is lying to everyone. Then, in an intriguing twist of fate, she finds herself in the hands of Aztec’s rebels and their leader, Tezca. Myla must now sort through all the lies she has been told her whole life and confront old secrets buried deep. Can she trust these people? Are they terrorists or freedom-fighting revolutionaries? And will she join them to dismantle the theocracy and its lies, or will the price she would be made to pay be too high? 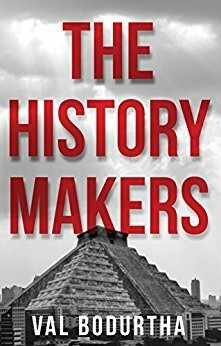 Val Bodurtha was selected as BookLogix’s 2015 winner of its annual Young Writers Contest for her novel, “The History Makers,” an alternative history she wrote at 17. Now a 20-year-old classics major at the University of Chicago, Val is an active writer, performer and producer, with a specialty in comedy. Her writing has garnered more than two dozen writing awards, and she has had three of her plays staged. That includes an Off-Broadway production of “What Really Happened,” a retelling of pivotal events through history, which was recognized by Scholastic’s national writing competition and featured at a worldwide play festival that David Letterman’s company sponsored in 2014. In Chicago, Val is a mainstay, on stage and off, of Off-Off Campus, the oldest collegiate sketch and improv troupe in the country. She has opened as a stand-up comedian for major headliners such as Jerrod Carmichael, and she is working this summer at Second City with the backing of UChicago’s Metcalf Internship program. She has been featured often in news coverage of young comedians and recently made waves for pressing Madame Tussaud's museum in NY to add a wax likeness of actor Paul Giamatti. "The country is pretty divided right now," she told TimeOut.com. "We think that this is one thing that can unite everyone." Before college, Val volunteered as an EMT at her local hospital in Stamford, Conn., and was named Horace Mann Idol by her school for her offbeat banjo-playing. This book was very good and I am very glad that I could read it. It had a cast of great characters that grew over the course of the story and the plot was well paced as well. I really loved the alternative history this title presented and I couldn't put it down. This was a great young adult title and I can't wait to check out the author's other books. The use of the Aztec traditions was fabulous it was a breath of fresh air.